A hit-or-miss style comedy that's more miss than hit. OK, so the first episode (the only one I watched) comes in just a shade under ten minutes. Long enough to get more than a few jokes in without overstaying its welcome. I got a one or two smiles and chuckles but not enough to hook me. The animation style is rather simplistic, like watching the Simpsons or a similar show. I'm mostly indifferent to animation as long as the content entertains me. This show failed at doing that. Two stars for the couple of smiles. Huh. I didn't think I would actually like this. The 3D animation program makes the art style look odd yet unique, but it was too unique for me to watch. The weird thing is, I actually liked this show. A lot. World Fool News is centered around Takahashi, in the "World Fool News" broadcasting station where Takahashi has now been promoted to. Originally, Takahashi was in the morning segment, but being promoted to the night shift is a huge promotion. Takahashi doesn't exactly know what he's up against, so he takes care to be as business-like as possible...which is why the character relationships he develops is hilarious. Takahashi is anchoring along Kanae, a very vocal woman who isn't afraid to keep her mouth open for the world to hear her thoughts. Takahashi trying to keep WFN in a professional light doesn't work against the manager who uses the programming block for the crew to get experience and just use the show as their own personal sandbox to explore. On the other hand, Takahashi has experience, and is a very good anchorman. He's probably not fit for the sandbox that is World Fool News, and this anime will make sure that you know that. Should you watch it? Yes. I'm at episode four (out of four), and I already know that you need to watch it. Actually, watch it for the theme song alone. This might be the only anime that I would bother re-watching. I was actually very surprised that I enjoy this show so much. While the art style is reminiscent of American cartoon contenders like The Simpsons, World Fool News is much different from its stylistic counterparts. The series centers around the employees at World Fool News. The show begins with Takahashi's first day on the job and introduces you to his weird new coworkers. While the first episode wasn't side-splitting, it was surprisingly full of events for a 10 minute show. It only improves with time. The latest episode (episode four) has been the funniest one by far. I have a feeling that as the season goes along, the same thing will begin to happen. It takes time for shorter shows to develop their characters. That's all that's necessary here. EDIT: After completing the series, I can say that I really did enjoy it and it's odd characters. I loved the episode when the hip young folks show came to visit. As time goes on, you get to know some of the other characters better and it's just as fun and entertaining. 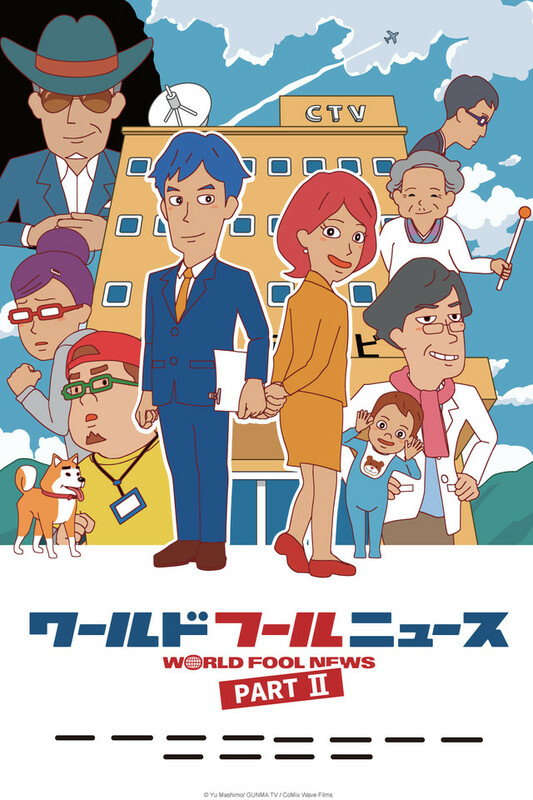 World Fool News follows a newscaster (Takahashi) who is transferred to an evening news program that is known for it's strange cast of characters. While the scenario may not seem completely relatable, the situations may be so. The first thing one notices when watching WFN is the interesting style of animation and art that is so obviously computer generated. Originally, I assumed this would be the moot point of this anime but boy was I mistaken (luckily). The animation fits perfectly into the strange but interesting slice of life style of the anime. The characters (of which their are a enough to be interesting but few enough for ease of comprehension) are-for lack of a better word-weird. But they have more depth than that and that is perhaps why I don't find myself drowning in a sea of weirdness punctuated by just one straight man. I suppose if I were to fault WFN in any way (if this even counts as one) I could pick at the fact that there are only going to be six episodes (or at least that's what it says on animelist). All in all, I found myself relishing the blunt and relatable humour and unique art style of World Fool News. This one felt really enjoyable. This anime has a fantastic cast of characters from the serious main character to the ridiculous super baby. As such it presents itself well as a comedy show with a unique art style, i would recommend this to people who enjoy quick shows with enjoyable laughs to be had. I therefore give this 8/10, if it was just a bit longer with more episodes it could have been higher. This series will have you laughing and crying. The slow pacing of World Fool News leaves you wide open for unexpected punchlines. Very catchy ending theme song. Okay... So now I need sixty four more characters... Now 29... And we're done... Now!! NOTE: I only watched the first episode. The short format comedy anime is probably my favorite. I devoured I Can't Understand What My Husband Is Saying and the equally excellent Tonari no Seki-kun. World Fool News doesn't hold a candle to them. It may even be the worst anime I've seen in 2014. This show is both offensive in design and writing. The animation is stiff and cheap, conveying no interesting characters or visual gags. I can excuse poor animation if the writing is solid but it fails in that regard as well. Jokes will be set up where the punchline is an exclamation or sour look. It's like a newspaper strip where the characters have nothing clever to say so they turn and look at the camera with half-closed eyes. Instead of a strong finish it ends in a pun so horrible that I literally groaned. Instead of ending the episode there the characters took 30 seconds to explain the pun. I can't recommend WFN. It's not pleasant to look at and if the first episode is anything to go on I'd be wasting my time watching anything else.